Copyright E J M Abbott, used with permission. 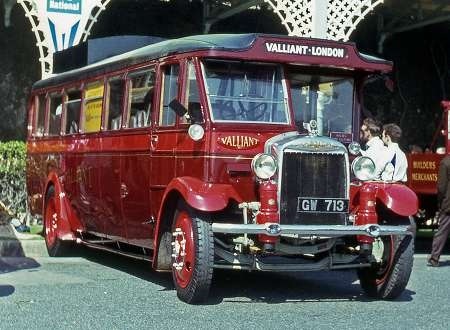 This is a photo of a 1931 Gilford 168OT coach with Weymann semi-fabric body along Brighton seafront. It is painted in the livery of Valliant Direct Coaches of Ealing, who owned it for many years. The coach was eventually saved by well-known bus saviour, Prince Marshall, and it languished for many years at the Science Museum Annexe at Wroughton, Nr Swindon, Wilts. Eventually, with the financial generosity of the London Omnibus Traction Society, Seb Marshall was able to restore it thoroughly to the immaculate state we see in the photo above. Gilford was a short-lived company from 1929 and 1935. It was unusual in that it never made anything, merely being an assembly outfit. It also made Wycombe bodies, with the parts also being made to order and bought in. As might be deduced from the body name, they were based in High Wycombe. They used American petrol engines, especially Lycomings. One unusual feature was the suspension which used Gruss Air Springs, another US import, the front cylinders being easily spotted either side of the radiator. They were more like shock absorbers and enabled vehicles to ‘glide along smoothly and supremely comfortable on four cushions of compressed air’! These were indeed superior vehicles! Gilford were very successful in the early years, but the Wall Street Crash and Depression took its toll and competition from the big boys intensified, with sales dropping relentlessly from 1932, despite new models coming out and a move towards goods vehicles. A late attempt at fitting the unreliable Meadows diesel engine did not help the situation. The final straw was what caused problems for several companies, the formation of the London Passenger Transport Board in 1933, with the consequent takeover and demise of lots of independents in London and much of the adjoining counties. (Christopher Dodd, a London bus body builder, who’d supported the independents almost exclusively, was wiped out at a stroke). The success of Gilford in selling vehicles to independents over the years created the situation where, after the takeovers, London Transport became the largest operator in the UK of Gilford buses and coaches at 220, for some five years, until standardisation started in earnest! Seb Marshalls blog on restoring GW 713 can be read here. Didn’t Gilford produce a prototype double decker of extremely low height and very modern appearance for the early 1930s?? I can’t remember if it was first a bus and later a trolleybus, or the other way around – I rather suspect the former. In any event it sadly never caught on apparently. Bus then trolleybus. The remains of Gilford went through two rapid changes of owner before ending up with Sentinel. Another case of interesting antecedents – like the Roadliner to Dennis R via Duple 425 "family tree". If we’re going ancient, let’s have more Gilford – although there weren’t many. What about Reo? [They were also used by the likes of Black and White.] …..and Sentinel who enjoyed a brief and honourable fling post war. If Gilford were the great might have been pre war then Foden and Sentinal were the great might have beens post war. Just a thought. I’m afraid my shots don’t go that far back, but if anyone wants to send me some then I will post them. I’m sure I saw a photo of Gilford’s double-decker bus/trolleybus once, but can’t pin down where. It was certainly modern-looking for its time. We’ve all heard of the famous AEC Q front-entrance double-decker, but around the same time, Leyland also built a similar vehicle, which had a squarer flat front (might have been lowbridge) and also looked modern for its time. I don’t believe there were any takers and it was broken up in the end, if memory serves me right. Anyone got a photo of it? I’m not sure where the engine was placed, though, but not at the front. Chris H, are you sure it wasn’t the Leyland TTB front entrance trolleybus? You’re right David, I was a little adrift there! I am sorry to say that Chris Hebbron’s original information is not quite correct in that the photo of GW 713 in Valliant livery was taken some years ago after initial restoration by Prince Marshall & not as a result of recent restoration by his son Seb Marshall. It is currently in a very dismantled state and the subject of a very major restoration by Seb after his acquisition of the coach from Science museum storage at Wroughton the progress of which can be seen on his blog via link at end of Chris’s article. Hopefully it will not be too long before it is once again restored to the immaculate condition shown in the photo. I contacted Seb Marshall to fill in the gaps between its original restoration and its subsequent sad demise into the condition it sank into before he started restoring it. I can do no better than send you his reply which I think is worthwhile printing. The photo was indeed taken in my father’s time, if you look closely he is driving, I believe it is Brighton ’63. Alas early preservation did not have the funding it does today and the body was very tired back then and was only cosmetically enhanced by Valliants. As we’ve gone into it we’ve discovered it has had a very hard life, with a number of framework repairs evident not surprising really as it went to war! We were planning to have it ready for Brighton next year, but work has dictated otherwise so sometime in the not too distant future is all I can say at the moment. You are right Chris, Gilford did build a low-height double-decker in 1931, and it was displayed at that year’s Commercial Motor Show. It was a very advanced design incorporating front wheel drive, thus allowing a very low floorline, as the usual bulk of the rear axle and differential casing were dispensed with. After delving into various books, all manner of things came to light. The bus was known as the ‘D-type’ (presumably for double-decker), and was of chassisless construction with an overall height of 12ft. 11ins, which was pretty impressive for a ‘decker with central gangways on both decks. The engine was also unusual in being a German-built Junkers horizontally-opposed 6-cylinder two-stroke diesel unit. A four-speed constant mesh gearbox was mounted ahead of the engine, and the drive then went to the front wheels. As usual, Gilford had fitted Gruss air springs to the vehicle, and the front suspension was independent to boot! 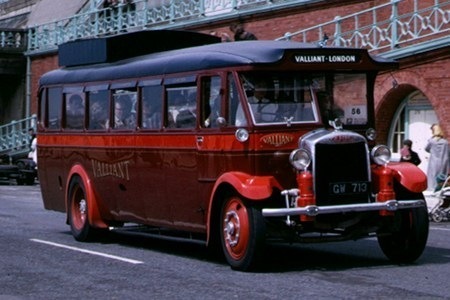 The Wycombe 56-seat rear-entrance bodywork was of steel-framed construction, and was of a modern-looking full-fronted design. A Tilling-style three-piece front window arrangement was used on the upper deck, with the outer glasses curving round to meet the front side pillars. Unfortunately, no orders were forthcoming, and as David rightly says, it was then converted to a trolleybus, and apparently saw service as such with Wolverhampton and Southend-on-Sea. A picture of the bus in its original form was shown in Buses Illustrated No.8, but I’m sure I’ve seen a picture of it elsewhere, and will keep looking! Gilford chassis designations were generally straightforward. The numbers denoted the wheelbase (in feet and inches) and the letters described the driving position. So an SD was Standard Drive (meaning bonneted, or normal control), and an OT was Over Type (meaning driver alongside engine, or forward control). As such, the engaging 168OT in the photo would be of 16ft.8ins wheelbase, Over Type layout. Its nice to see my grandfathers coach on the sea front I remember him talking to me about the coaches he had. Stephen – I’m glad that the photo gave you pleasure. You will no doubt know that your grandfather is greatly respected among the bus enthusiast fraternity for his successful efforts at bus preservation when it was in its infancy. Brendan, Thx for researching all that useful information on the ‘D’-type, most of which I was unaware of. As ever, it was a mixture of their own construction and buying-in parts and, as ever, the conservative bus industry of the time stayed well away from purchasing it, despite the general good name and record of Gilford. A photo of it would be wonderful, if you can track one down. Sadly, although I can boast about three of the earliest Buses Illustrated somewhere, No. 8 wasn’t one of them, more’s the pity! The patent number for the D-type is (GB)353,902 and was applied for by the Gilford Motor Company Ltd and Edward Bert Horne on April 29th 1930 and accepted on July 29th 1931. The drawing shows a lower deck plan, with the engine protruding significantly into the lower saloon with two pairs of rearward facing seats to each side of it, and a vertical section through the bus showing the front wheel drive and Gruss springs. You can view the drawing here. Thank you for posting such an interesting technical drawing Malcolm. I had read somewhere that the engine on the D-type had intruded into the lower saloon, but had not envisaged it doing so by quite as much as shown! The seating arrangement around it was fascinating – and what seats for the enthusiast they would have been, right next to that two-stroke engine…. I remember reading an extensive history of Gilford in Buses Illustrated once complete with many photographs. One reason for their demise mentioned was a large part of their market was to independents, and I understand that the problem was many of them were unable to pay the instalments on the purchase. The same thing brought down Guy in South Africa, where they sold direct to small operators who didn’t pay up or disappeared into the night. Don’t I remember a section here on OBP about a year ago devoted to the Gilford decker, photos, drawings and all? I’ve searched but can no longer find it. Here is another picture of GW 713 taken at Madeira Drive at the end of an HCVC London – Brighton Run in the early 1960s. By the 1970s this coach had been repainted into the livery of Evan Evans Tours.